We made it! 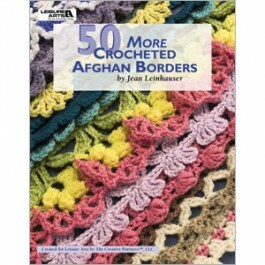 We have finally hit the border section and we'll soon be able to enjoy our afghan just in time for fall to set in. 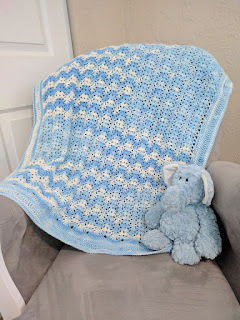 I wanted to keep the border on this simple to show off the stitches so I chose to keep it simple. 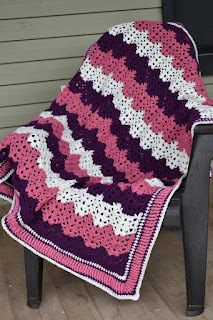 I thought the fringe would be fun to add to the length of this afghan. 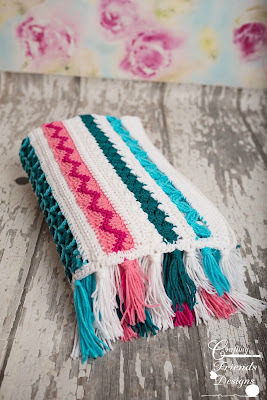 If fringe is not for you, simply skip the ch-2's on round 2 of the border and work a solid hdc round. Let's get started and finish this baby! It's time for a new afghan release, don't you think? 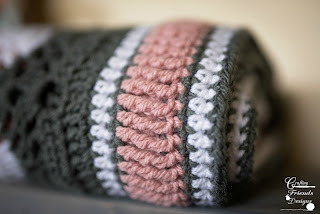 I have always loved the combination of Pink, Gray and White. There is just something calming and comforting about those 3 colors together and I've wanted to create a design with them for quite a while. 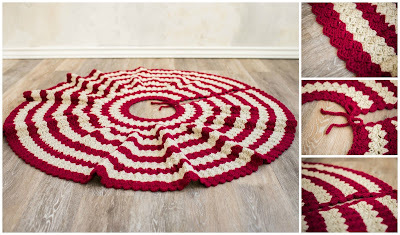 This past summer, I was able to work with Craftsy on creating a few Christmas tree skirt and afghan crochet pattern kits using their Sprightly yarn line. I had never worked with it before and was excited to try it out. When it comes to yarn shopping, I like being hands on. I like to see it in person and touch it and squeeze it and run my fingers through it to see what it's going to feel like as an afghan. I don't want to order a bunch of yarn only to have it be scratchy and stiff. I'm here to tell you - Sprightly Acrylic is wonderful! It has a good thickness to it but it's soft and flexible to work with. If you haven't tried it yet, you really should! 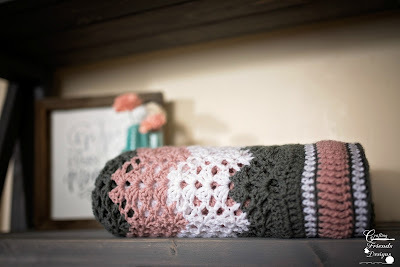 I've been designing a bunch of afghans with texture lately and really wanted this color combo to be light and have a good drape to it. You all know how I love chevrons so that was my first instinct. However, sometimes it's nice to have the chevron look but have a solid, squared off border so you don't have all those ups and downs on the ends. 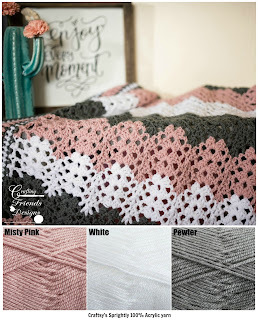 With the Champagne Blush Chevron Afghan crochet pattern, you get the best of both worlds! I loved how this turned out and my daughter instantly asked if she could give this one to her teacher for Christmas. I hope she likes it! I hope you love it too. I've set up a special offer just for my blog and email subscribers. Use code CFDBLUSH at checkout on Ravelry to receive 60% off this pattern through Sunday 9/17/17. While you're there, be sure to add it to your favorites! Thanks to Amber and Krista for testing the pattern and to Ash & Co for some amazing photos! Hooray!!! This is our LAST section before we start the border of your amazing projects. I seriously am so excited to see photos of all your hard work! 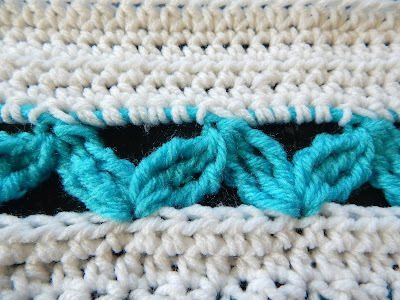 This week, we are working the fun Zig Zag stitch and you'll be done in a jiffy. This stitch would be pretty leaves when working in fall colors or fairy wings in pastels. I can even picture them in green and adding an apple applique underneath them for a fun accent. Imagine the possibilities! Can you believe we only have 1 more section to go before the border? I hope you are loving your project so far! This week, we are back to the Brick Stitch. 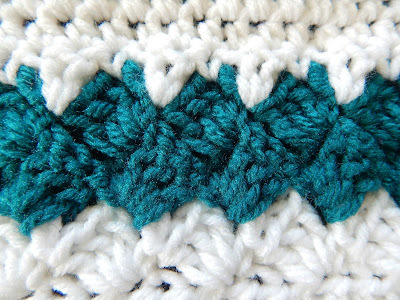 This is one of my favorite stitches and so fast to work up. 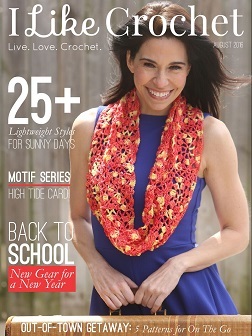 Enjoy your crochet time this week!